In an interview with our colleagues at Le Figaro, Samsung CEO DJ Koh confirmed the ambitions of the world's leading manufacturer and gave his thoughts on future trends: folding smartphones, 5G, video service... we've selected a few pieces, translated into English, that illustrate the goals of the brand. Samsung fears no one, especially not Huawei. This is essentially what the Samsung president wanted to point out. Huawei's ambitions to become the number one do not scare the Korean veterans. "Samsung has been a leader in the smartphone market for 10 years and will remain so for the next 10 years by continuing to innovate and imagine new mobile experiences." To continue to be the leader, Samsung is focusing on the 5G and folding smartphone markets. "New technologies such as 5G or AI and new design formats such as folding smartphones are indeed emerging faster than we thought." However, Samsung remains blocked by the development of the network itself with regard to the new generation of mobile data. DK Koh simply explains that "we will naturally offer our 5G smartphones ... as soon as the 5G networks are ready". The South Korean manufacturer intends to take full advantage of the problems encountered by its competitor Huawei in this area, particularly with suppliers and operators. "I trust Samsung to provide end-to-end 5G solutions, from network equipment to device and chip, while ensuring security.security and data confidentiality through a close partnership between network operators and service providers around the world. " "Personally, I see a very big potential for the folding smartphone segment," explains DK Koh. "Consumers are looking for larger screens without sacrificing portability. Until now, we lived in a world where the screen size was limited to the size of the device itself. Samsung has taken into account the evolution of these needs and has radically changed the game with this new smartphone format and the resulting unprecedented mobile experience. Samsung's folding smartphone is not only a new category, we are writing the next chapter of the mobile industry." The Galaxy Fold, the brand's first smartphone of this type, will therefore arrive in Europe on May 3, at a price of 2020 euros/ £1799. It costs $1,980 in the US. 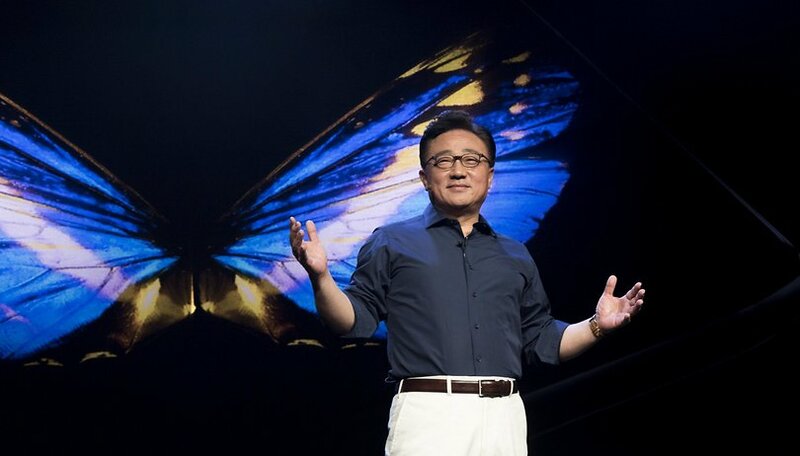 Presented at the Unpacked event dedicated to the Galaxy S10, Samsung's foldable smartphone should bring a breath of fresh air to the market. However, there are many doubts about the device which, until now, has remained quite mysterious. Only a few videos have been released so far. "Folding is a more intuitive gesture but is a more difficult innovation to conceive. We have therefore created a new type of foldable adhesive and new manufacturing processes that allow the layers that make up the Galaxy Fold screen to bend without increasing its thickness while being durable enough to withstand hundreds of thousands of bends. The biggest challenge has been to create our thinnest smartphone screen to date. To achieve this, we have designed a screen that is almost 50% thinner than on a conventional smartphone to reduce its thickness when folded. " Mate X vs Galaxy Fold: who flexes best? Finally, unlike Apple's ads, DJ Koh denied any interest in launching a video service. "We are not interested in launching a Samsung-specific video service." The brand's efforts will focus more on improving its Bixby voice service. Do you think Samsung is right? i think they should be afraid of huawei. sammy is too big for their britches and are afraid to move too far in any direction because profits are already on the decline. meanwhile, huawei is constantly probing the market to see what works while sammy watches from the bushes. The way I see it I agree, Samsung has been the leader in the smartphone world for the last ten years. The way they innovate & market their products it will be difficult to dethrone them. This is plain & simple. Their display technology is the absolute best. HDR10+ & super steady mode while shooting videos is no contest. They will continue to lead the field! And Huawei does very badly in video department - no 4K 60 FPS, low levels of details in the videos and off colors. Its like a midrange smartphone or 2015 flagship.